CNN speaks with Fareed about the latest developments in Iraq and U.S. involvement in the region. This is an edited version of the transcript. So, aren't these boots on the ground in Iraq? You know, they are boots on the ground. But I think in a way that's a kind of weird shorthand that we’ve developed to try to understand whether or not this is an open-ended mission. The really important question is, what is the nature of the mission? You go into a country and say we are going to save the country, restore it to its normal functioning, nation build – those are vast open-ended missions. It's not clear how you would do them. It's not clear how you would ever know you had succeeded. Here, you have a very defined mission. The idea is to try to save these Yazidis, to perhaps bolster the Peshmerga, the Kurdish forces. That seems to me pretty doable. There is a great danger, and I understand it, a wariness about getting more involved in Iraq. But you don't slip down every slippery slope. Once they come off the mountaintop, what do we do for the Yazidis? Where they will go is probably the ones that want to leave will go into Kurdistan, the Kurdish part of Iraq, which is very tolerant, but also very secure, and will become increasingly secure because we are now supplying the Kurdish forces with arms. Remember, because these guys are an autonomous part of Iraq, the United States wouldn't sell them weaponry, wouldn't give them weaponry, because the idea was that that's violating the central government. You know, we're meant to be giving money to the Iraqi army, not to this group of militias. Well, we have gotten over that now. The United States is helping the Kurdish Peshmerga. The Yazidis will go there. That's a secure, safe, tolerant place and can be defended. Why didn't we help in other places, as it's been pointed out, that the Obama doctrine seems to pick and choose. Is it just because this one was doable? That's not a small concern. 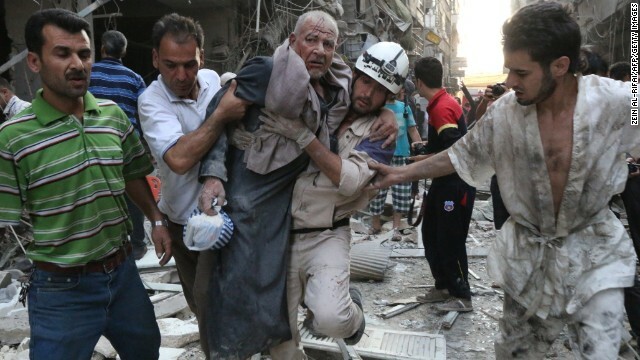 The fact that Syria is experiencing a humanitarian catastrophe is very real. What are you going to do about it? How are you going to go in? Is there a way you could actually lessen that? A lot of people say we should arm the people opposing the al-Assad regime in Syria. But in the short-run – and there is very good academic literature on this – when you support one side in a civil war that is pretty intense, it only prolongs the conflict. Because what is going to happen is al-Assad is now winning, sort of. The United States and other forces start helping the other side, they're going to start killing more Alawites and al-Assad supporters. The war goes on, and if it goes inconclusively, more people die. Again, that's why I think this one is both from a humanitarian point of view worth doing, but also doable, because there's a discreet, narrow mission, you're trying to save these people, there is a place they can go to. You can secure it. None of those conditions are in Syria. So, yes, there is a practical reality, just as we all face. You want to help lots of people in the world. But you do ask yourself, is there a smart way? Is there a charity I can do something with, where they do good, it's effective, it actually makes a difference? Those are reasonable concerns for the Obama administration. « Previous entryHas Colombia's time come? Hillaries record: a) She voted for the Iraq war without bothering to read the intelligence. b) She, along with Samantha Power was a big advocate for our Libyan adventure. Bottom line, her 'insight' led to two of the worst foreign policy actions of this country. Her assertion, we did not support rebels. Actually, we outsourced an attempted regime change, encouraging Saudi and Qatar to arm the rebels. These armed/funded etc in fact the genesis of ISIS, Al Nusrah etc. So, in allowing, even encouraging this, we played a part in the creation of this revolting menace. The absurdity of Clinton, who had to know as she was in gov at the time, is the assumption that they could control these people and limit them to Syria. She is clearly completely inept, cursed with poor decision making skills and so on. Not that I am advocating for Obama – he should never have allowed himself to be talked into Libya, and should not have gone along with the outsourced regime change. He is seemingly week. Hillary Clinton has revealed her opportunist streak. She threw Obama under the bus to save her skin. She was realistic enough that arming the Syrian rebels would hardly have made much difference. Yet when it served her a purpose to put Obama on blast, she did it without hesitation. Despite Obama's faults and shortcomings he has more class. I think the Syrian rebels were ISIS, weren't they? Regardless, I just heard on CNN that alot of the ISIS forces are heading back to Syria, were there strongholds are. I am sure Assad and his troops know very well where they are located. This might sound sick, but I think it's time to let Assad get after him the way he seems will work out. And we all know what that means-WMD's. Better ISIS get hit then us. And one more thing, why do we give them the glory of calling the ISIS and showing all the atrocities they are pulling off. And if we got to see them on the news, find a degrading new name for them. Asad had always shouted from the top of his lungs that USA is arming the rebels who are terrorists and members of Al Qaida. Thanks to the Israeli influence, the US did not listen to Asad and thus the development of ISIS .Now USA is in a bind, thanks to Israel also. There is too much influence f Israel over US policies in the Middle East. Thanks to past Israelli influences on US, we saw a stable government in Iraq get a "shock and Awe " treatment and is now broken into fragments. We saw a peaceful Libya being destroyed with Western and American complicity!! And the Americans still have the naivety to wonder, why there is so much terrorism in the Middle East. Thank the USA for creating and funding terrorism and fighting a proxy war on behalf of Israel. When the US took out Sodom Hussein ( for the fun of it) out of power in Iraq (looking for WMD's), and then turning Iraq over to the Shiite government, left Sodom's Sunni army officers NOW- ISIS brains behind the Sunni Jihad Terrorist group. try reading before you start making things up you don't know anything about. It looks that decisions made by the Mullah Shia Iran regime advisory!! Are you Snowden? What a blabber mouth.! President Obama, America's finest foreign policy president since FDR, is properly providing support in Iraq, and not getting involved in other nations civil wars. President Obama, America's finest foreign policy president since FDR--------Have you lost your mind? Obama's foreign (and domestic) policies are a joke and have made him the laughing stock of the world. You are absolutely wrong. People all over the world admire and respect him. He also knows more about foreign policy than you or anyone who thinks like you. You are so full of hate, you can't think straight. BOB is right, are you Color Blind and can only see WHITE? Keep the US out of other people's civil wars. Who designated the US military as the policeman of the world? The new world order advocates and the warmongers like Bush the neo-cons, McCain and Clinton should be labeled as enemies of humanity for the instability and murderous civil wars which their policies and actions have created in Iraq, Syria and for that matter in Libya. "birthplace of civilization" and thus can be made claim to. Essentially, that's going towards a much greater conflict, but one that's more colonial or Crusade like as we're there to conquer the land and no longer just eliminate the threats. Perhaps its time Islam is declared a threat to world peace and the entire area is conquered; Europe gets a piece, Russia, India, China, and the US. Not proposing, but sometimes I think this is the way the world is trending as states cannot be "Sick Men" forever. Everyone understand that Obama being inexperienced in foreign policy (or domestic for that matter) has been very cautious not to make a big blunder especially given his low ratings which he earned. But the fact that he has not withdrawn ALL troops from Afghanistan which he promised in 2012, that's costing US billions every month with absolutely ZERO value to US. In fact, it is China and Russia who are benefiting from keeping Islamists in check there. We need to adopt a laissez-faire foreign policy instead of just jumping into these situations. In other we Americans need to simply mind our own business and take care of peoblems here at home. It's best to not get involved. Humanitarian aid with limited air strikes to help refugees is all that should be done. Obama is doing the right thing. Anything more and we risk further escalation. We invaded Iraq and Afghanistan because those invasions seemed "doable". Pick and choose has been the American doctrine ever since Vietnam. Meanwhile Hillary blames Obama for the rise of ISIS. ISIS arose from political instability. When you roll into a country and annihilate their government completely, the result is political instability. It takes more than a mere ten years for the dust to settle after this kind of invasion. Blame whomever you like, but the truth is obvious: Iraq is politically unstable because of the US Military and the commander in chief who launched the invasion and destroyed Iraq's government. The blame for Iraq's problems lies at the feet of George W. Bush and the Americans who voted for him. They voted for him because they knew he planned to invade Iraq and they believed that an invasion of Iraq was the right thing to do. Absolutely but the Americans are bombarded by false propaganda from their media. They do not even have a clue anymore of who is right and who is wrong.. The "bogey" of Al Qaida hitting America is so ingrained in the mind of Americans that they cannot even see beyond their shoe strings. Today most of the world holds USA and Israel in what is happening in the Middle East. These little wars are going to lead into bigger wars and no one will be safe. The US foreign policy for the Middle East stinks, thanks to the clowns who have led White House and the naive American public who are brainwashed, just like the Russians were brainwashed in the sixties and the early seventies. We must stay out of Syria at all costs. Unfortunately, the right-wing thugs in Washington don't see it that way. My position is "evolving," as they sometimes say in Washington. This is like what happened in Korea. We went in found ourselves ultimately fighting China. We went into Vietnam after the French failed and would up fighting China. We went into Afganistan and would up created the monster Bin Laudin and we're still getting our butts kicked in. We went into Iraq and destroyed the balance of power in that region and now are fighting ISIS,Al Queda, Syria, Iran and ultimately Russia. What lesson should we get from this?? Help our allies when they need and ask for help. Get in and out ASAP. We have huge problems here in the US. I'd really like to see us take care of our own. If we can build up our Nation again, then we can go out there and help others. But, we should always take care of our own first. Why bomb people to save people? Everyone has their price, even Islamists, It would probably be far cheaper to buy everybody in ISIS a new Mercedes if they stop fighting, then it is to take the military approach which cost's Billions, even Trillions. I know peace is not near as much fun as watching the Drones score points but we all have to make a sacrifice once in awhile. Pretty sure you're joking bout the Mercedes. Gotta feeling this will go on for a long period of time. Every little inbred grows up hating America. Seen a 10 year old on the tube yesterday holding up a severed head. Photo taking by his father who said "That's my son". Since Syria is their stronghold, I wrote earlier for the US to let Assad do as he pleases to take care of them cowards. No matter what it takes. Wonder what the Middle East would be like today if all the dictators were still in charge of their countries. Be much quieter I think. Not only much quieter but developing fast under these dictators. Sooner or later they would have had to go into what would have a natural transition to a democratic government. We would have never seen this chaos. But then Bush and his cohorts such as Rumsfeld ,et al would have never made so much money either!!!! The American public is responsible for voting such idiots in power exactly in the same way as Gazans are responsible for voting Hamas in power. Lol @ William Bellah...it would appear that SOMEONE is getting a wacked out kick outta this insanity wouldnt it? I think that we are talking about a father who needs to be teaching his son that handling parts of deceased human beings is one was to get the Ebola virus. Lol @ Joey make no mistake, i DO agree with you but....i had no part in THAT conversation at all! Yes @ Ferhat i noticed that very thing! I would not have thought she would do that but she has! The real reason is that Russia will never give up its one foreign military base there. Russia is the only other country besides the USA that has a military base in a foreign country. Russia has one, the USA has 633 military installations in 38 countries. And with events in Ferguson, can we really claim Americans have any moral authority? Of course not, S.D.! Then again, the right-wings thugs in Washington care very little for morality. And where was Hillary when Benghazi going down? She was in Perth Australia arranging for yet another military base- this one in Perth as if the Queen of England cannot or will not pay to defend her turf. Just another case of the USA not getting its freedom in 1776 and defending our former enemy's empire than many founding fathers died in battle to get free from. Lol @ Joseph wouldnt Hillary be considered "left wing"? Mr Zakaria giving money to terrorists (US rebels) is also intervention.Please cleariy it with Americans.